A WOD And Then some! *I don’t have the strength to do Muscle Ups….yet, so I did pull ups & ring dips (both with the assistance of a band). Initially I was hesitant performing the box jumps on the 24 inch box because my shins are still healing from last week’s slip. With encouragement– actually it was more like a direct order from the instructor I “man-upped” and completed my rounds on the 24″. Whew, no slip ups! Although I’ve completed more challenging WOD’s, I was still fatigued when I finished. Tomorrow’s WOD might be one to contend with. Immediately after the class, hubby and I made a few stops to get supplies to begin painting Tailor’s room. Once we got home, I ate a quick snack (a Gala apple & some cashews) and started priming the wall. The primer needed one hour to dry. That’s all I needed, so I ran. My sore hip is healing and I don’t want to push it, so I planned to run 3 easy miles. 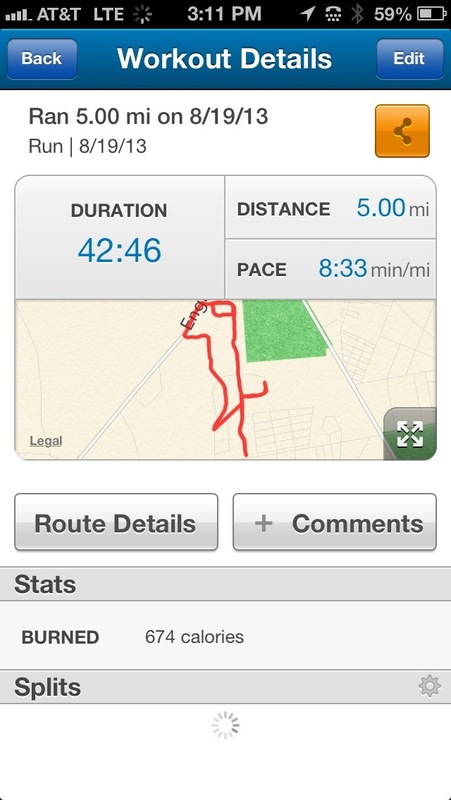 Well… it felt darn good to be out there, I ran longer. Lol! Trying to put how I felt into words is difficult. As I listened to my favorite play list, I laughed and enjoyed every step. My run was heavenly!! During my run, I didn’t feel like I was running hard, I got into a nice rhythm and ran at a comfortable pace. There is no doubt that I am seeing the wonderful benefits of CrossFit. Even though I haven’t ran much in the past two-months, my pace and splits continue to improve. I am over-joyed! This entry was posted in Fitness, Healthy Living, Uncategorized and tagged CrossFit, handstand, pull ups, Pull-up (exercise), Push-up, runners, running, WOD, women runners over 40. Bookmark the permalink.